We had three days in San Pedro de Atacama and spent a total of around 300 SGD each. 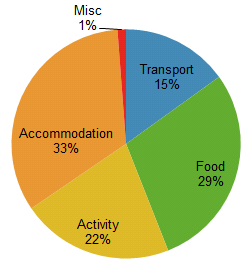 After Peru and Bolivia where activities were the biggest expenditure, accommodation was once again where we spent the most on in Chile. Our 20,000 CLP bus from San Pedro de Atacama to Salta was the only transport expenditure that we had n Chile. Food was a close second to accommodation. We had quite a few meals which were around 20 SGD per person. Our cycling excursion to Valle de la Luna and the tour to El Tatio Geysers were the contributors to this category. Laundry (most expensive of the trip). This entry was posted in Chile and tagged Chile, Summary. Bookmark the permalink.